First off, I'd like to thank the generous folks at Nick Sciabica and Sons for their delicious olive oils! I've been on a personal quest looking for some really good olive oil, and this oil is superb. Not only did I use Sciabica's olive oil for this recipe, I also use it for dipping, adding some fresh garlic, basil, crushed red pepper flakes and some salt. Sciabica's sent all of us at 37 Cooks two bottles each of any flavor oil that we wanted. 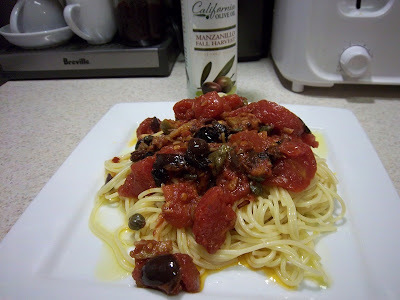 For this recipe, I chose their Manzanillo Variety Fall Harvest Extra Virgin Olive Oil. I had decided to make Spaghetti alla Puttanesca, well, because of it's rather colorful history! I've never had puttanesca sauce before and didn't know what to expect. This dish was absolutely delicious! I don't know if it was 'authentic' or not, because I used a white wine reduction in it. All of the recipes I read didn't have the wine in them. Most all of the recipes I read were pretty much the same, so I just mixed a lotta the recipes together and came up with my own, which we will be making on a regular basis! Heat a 12" skillet on medium heat. Add all but about 3 Tablespoons of the olive oil to pan. Add the garlic, crushed red pepper flakes and the anchovies. Cook until the garlic is translucent, but don't let it brown. The anchovies will melt into the oil as the garlic cooks. Once the garlic is cooked, add the capers, olives, wine reduction and the tomato paste. Turn the heat up a little and cook, stirring until the tomato paste is cooked into the sauce, then add the chopped tomatoes. Lower the heat, just until the tomatoes are heated through, add salt and pepper to taste. Plate the spaghetti and top off with a generous portion of the puttanesca sauce. Have plenty of good bread to soak up the sauce!